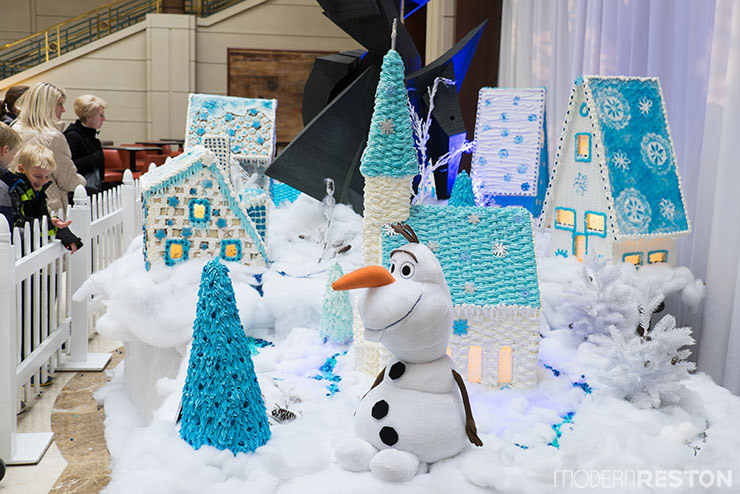 Every December, the lobby of the Hyatt Regency Reston features an intricate gingerbread village created out of hundreds of pounds of sugar and flour. 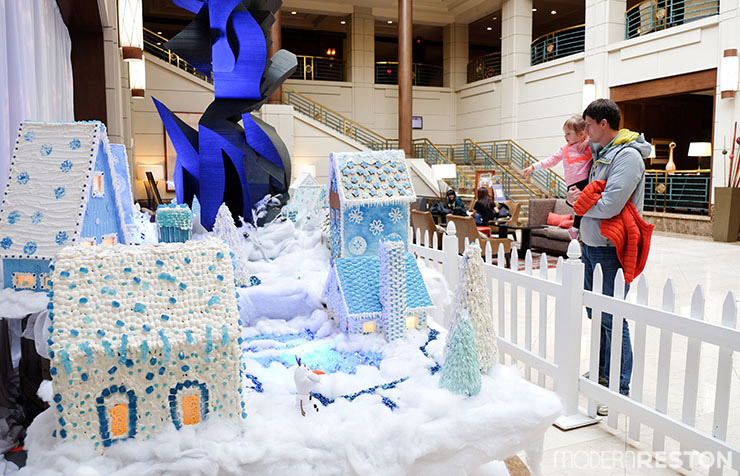 Visiting the gingerbread village is an annual holiday tradition for many Reston families, and a cherished part of the holiday experience at Reston Town Center. The gingerbread village is a charity fundraiser that has collected over $8,000 in the last three years. Previous donations have been awarded to the Philippines Typhoon Relief Fund and the Hurricane Sandy Relief Fund. This year’s donations will be given to Cornerstones of Reston. You might be surprised to discover that the village is created by the Hyatt’s own pastry chefs. I had assumed that the hotel hired specialized contractors to build it each year, but that is not the case at all. The Hyatt’s gingerbread village is very much a local operation. I spoke with two pastry chefs at the Hyatt, Zenona Bernat and Sabrina Schneider. Their regular job roles involve preparing desserts for the hotel’s restaurants throughout the year. 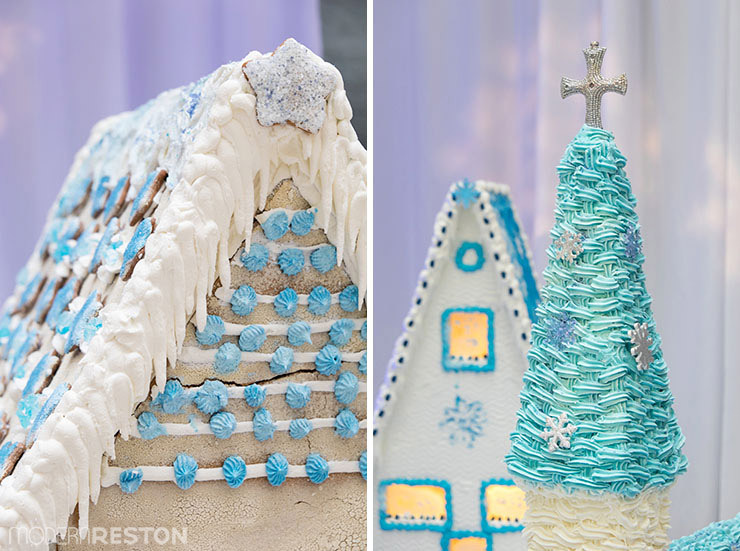 During November, in addition to their regular job tasks, they spent two solid weeks baking, building, and decorating the gingerbread village. 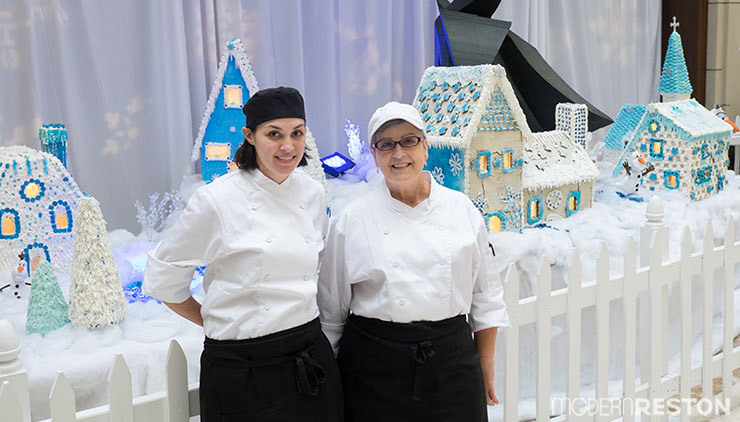 Zenona has worked at the Reston Hyatt for 19 years, and she has helped create the gingerbread village each of those years (with the exception of one year that the Hyatt did not have it.) Sabrina is new to the pastry team, so this was her first time working on the gingerbread village, and she said that she learned quite a lot about the process. I asked them if they had tips for people who want to build gingerbread houses at home. “Use the gingerbread before it dries,” Sabrina told me. Otherwise it will crack and break easily. Zenona agreed, and said that gingerbread also warps as it dries. They explained that gingerbread must be fresh enough to be flat, moist, and somewhat pliable in order to be usable when constructing a house. As they told me about the process of building these houses, I was even more impressed by the effort that goes into it. Those walls are sheets of bendable and breakable gingerbread, held together with sugar. It’s a remarkable feat. Sabrina laughed and said that as she was learning, she broke a lot of her creations. I can only imagine the heartache involved in that! If you would like to support the efforts of the Hyatt Regency Reston and their pastry team, please stop by the lobby of the Hyatt at Reston Town Center to visit the gingerbread village. It will be on display through the end of December. A donation box is available for your voluntary contribution to Cornerstones. The lobby is open to the public, and Reston locals are encouraged to visit and enjoy this grand display. While you’re there, be sure to note all the small, exquisite details in the village. It’s a fascinating work of art.